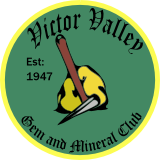 The Victor Valley Gem and Mineral Club is a 501(c)4 Nonprofit Educational club. Although stirrings for a rock club began in 1941, formal organization of the Victor Valley Gem & Mineral Club took place in May 1947. The then "Victor Press" reported: "Fifteen Rock-nuts gathered at the Community Center with Bert Dunham and Mike Will to form Victorville's Rock Hound Club. It is open to all rock collectors. The club's aim is to promote interest, exchange ideas, form field trips, and bring in outsiders and educational features along the lines of rock collecting." Ideals of the club have not changed, 'the membership has climbed to nearly 160, drawing from the entire Victor Valley, Wrightwood, Phelan, and other surrounding communities. In the early years, meetings were held in members homes, schools, parks, etc. Need for a clubhouse was felt and in 1952 a lot on 7th street, between Victor St. and Mojave Dr., was purchased from Sherman Marquand for $1,500. (A year later the adjoining lot sold for about $10,000.) Rummage sales, raffles, bake sales, etc. were held to establish a building fund. Even junk cars were wrecked and parts sold to build the fund. Construction was begun in 1960 with two bungalows bought from the school district and joined together to establish a floor space of 68' x 23', including kitchen and lounge. Over 100 guest and civic leaders attended the grand opening on Sept. , 1961. Thirty cases of minerals and lapidary work were displayed in the new clubhouse, and a rock show was held there only 2 weeks later. The following year, 1962, enthusiastic members and officials of the "Victor Press" had ground breaking ceremonies for the large commercial building on the front of the club lot on 7th street. The "Victor Press" leased the building, built to their specifications, for 10 years. Since then it has been leased to the Reliable, now Kamen Bearing Co. The original club building entertained many, many happy functions and events until October of 1988 when it was leveled to build our current structure. Which has more meeting and workspace area. For a little over a year the Gem & Mineral Club met at the Apple Valley Grange but by Christmas 1990 the club again was functioning in it's own place, meeting, learning and educating members. Keeping to the club's aim to promote interest in the earth sciences and rock hounding hobby, club members have supported community service events, placed displays in stores, banks, libraries and public buildings, have gone to schools, rest homes, social clubs, scout groups, churches, and parks lecturing and giving hands on hand demonstrations. Fine exhibits have been presented to the local museum. A cairn of desert minerals was erected with a sundial at the 4-H fan at the fairgrounds. We have entered floats in the parades. We have reached out and touched our community. Only a couple of months after organization the club began holding shows to share their hobby with the public. The first was held in a park. For many years these shows also had displays by Mojave Cactus Society and the Hi-Desert Artist. In 1948 the club spearheaded the mineral and lapidary display at the San Bernardino County Fair which at the time was held in dusty wind-blown tents. In 1948 prize money of $700 was offered at the Fair for the best displays and a special award for the best mine strike. An exciting darkroom show of fluorescent minerals greeted visitors in 1950. The 1958 Fair drew the following accolade: "Most spectacular gem and mineral exhibit in the state." Huge crowds came to see the 104 cases of lapidary arts in 1964. For 26 years Victor Valley Gem & Mineral Club participated in this annual event. Many fine trophies are displayed in our clubhouse showing honor to our participation. In 1985 the club chose to break from the Fair event and now holds its own Annual Gem & Mineral Show, the third weekend in October. (Now the third weekend in November) This event hosts many dealers and has many displays and demonstrations complementing the hobby. Visitors come from allover the Southland and adjoining States to gather in the sights at this popular event. Affiliation with both the California and American Federations of Mineralogical Societies occurred in 1955. We have been active supporters ever since. In 1968 the club joined with the Boron and Antelope Valley clubs to host the CFMS show at the Lancaster Fairgrounds. National recognition was received in 1977 with being awarded the "All American Club" trophy by the American Federation of Mineralogical Societies for being one of the most outstanding clubs in the nation. In 1978 the club hosted the CFMS Bulletin Editors Seminar at which 65 attended from other clubs. And in October of 1980 is again was host to 54 CFMS Field Trip Chairmen, for a seminar. We have had excellent representation at all of the Federation gatherings and have put displays in several of their Federation Shows. For the past 21 years the club has hosted a free field trip and tailgate weekend open to all clubs and rock hounds at Stoddard Wells collecting area. This has been a popular winter event drawing clubs and rockbound enthusiasts from all the western states. It is currently held the third weekend in March and this past year drew over 2000 people. Good fellowship has combined with rock collecting. Pot-luck suppers are monthly social events at the general meeting. Education programs covering all facets of the earth sciences and our hobby are held monthly. Field trips have led hardy rock hounds to mountains, deserts, rivers and remote area digs. Each year we migrate as a club to the winter pow wow of rock hounds at Quartzsite, AZ for a week of fun and campfire & fellowship. Lapidary working equipment installed in the clubhouse has a steady workout. These include 24" saws, 18" saws, trim saws, grinders, polishers, laps, drills, sphere makers, etc. We have a special room equipped for silver work and casting. Workshop sessions are held on the 2ND Tuesday of every month, and every Wednesday, Thursday, and Sunday. Expert instruction and supervision is provided. A memorable quote from one of our Past Presidents, Elmer Rehme, on the occasion of the "Burn-the-Mortgage" dinner in 1974, "Let's celebrate and show our appreciation for the efforts on those good people who had apart in founding, building, and continuing the work. Their names and foresight should not be forgotten. Our building and property is a monument for the future generations of rock hounds to use and enjoy." To this challenge also, we as a club continue to support the original goal to promote interest in the earth sciences and our hobby so that it will be apart of the generations to come. Since 1992 Victor Valley Gem & Mineral Club has given several $1000 Scholarships to college students perusing earth sciences at Victor Valley College. And in 1996 VVGMC purchased a special computer and printer for Sultana High School in Hesperia so they could gain access to the Internet to research areas of discovery in Earth Sciences. Students will now be able to contact NASA, .JPL and various universities to exchange information and to talk to scientists and researchers through E-mail.